This will change how you fish rivers, and how you think about fishing rivers. Big fish holding in quiet waters, where you would not think to look. 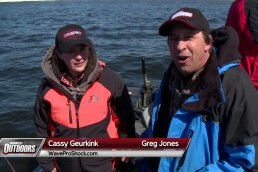 Behind the scenes of the ‘River Zones’ series in MidWest Outdoors magazine. For about six years, Dan Gapen, the head river rat, and “Bobber” Anne Orth have been hard at work refining their understanding of a river-fishing discovery they made while testing a new lure called the Spin Bee. Somehow, they kept it a secret all this time, waiting until they felt confident in their understanding before offering it to anglers. We are excited that they approached MidWest Outdoors about publishing their work, which appear in a three-part series, in the January, February, and March issues of 2016. It all happened when Dan and Anne were out testing the Spin Bee. 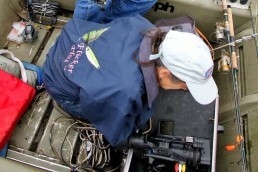 Anne was using a custom underwater camera system they had built for the purpose. While crossing from one side of the Mississippi to the other, Anne left the camera down, just to see what she could see. Surprise, surprise, a school of big walleyes was holding near bottom, well away from shore and the influence of obvious obstacles. 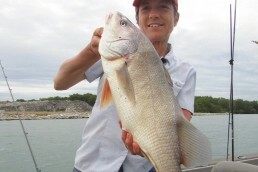 In a place you would expect the current to be humming along, making it difficult for fish to be. After catching a few of the walleyes (you gotta have fun, even when testing lures, right? 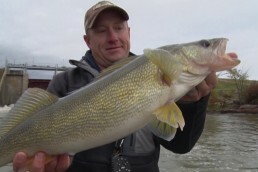 ), the pair went back to filming the lure in action, hoping to capture strikes, over these same mid river fish. As the lure was lowered within about 8 to 10 inches of bottom, the spinner blade stopped spinning. At first, they thought something was wrong with the lure. But after several repeat trips to the Mississippi and other rivers, they realized they were on to something. That they were finding slack-water zones, in which fish and food were holding, in places where the river’s physical makeup would not seem to explain their existence. A study of the scientific literature revealed many discussions of the complexities of current flow, including a concept called the Benthic Boundary Layer, which describes a slack-current zone created by friction between the moving water and the stationary river bed. But it is described as being so thin that even flat-bodied insects can barely dip their toes in it. Not enough space to hold a fish of any size. Because their discovery is of slack-water features plenty big (“tall”) enough to hold good-sized fish, they decided to call them Benthic Zones. The ‘Zone’ name seemed accurate, given the height to which the slow-or-no-current area rises off bottom. MidWest Outdoors editor Mark Strand spent a day with Dan and Anne this past fall, in mid-September, while working on the magazine series. He sat with them on the banks of the Mississippi, in a place where they conducted some of their research, and had them describe the discovery, and talk about their evolving understanding of Benthic Zones. Here are some highlights of that conversation. Watch and enjoy!